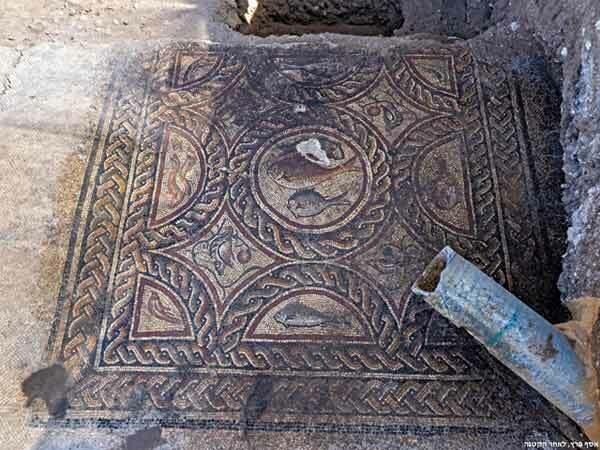 In June 2018, a salvage excavation was conducted at the site of the Roman mosaic in Lod, in the Newe Yaraq neighborhood, between Struma, Yarden and Ha-Haluz Streets, west of Route 40 and Ginnaton Junction (Permit No. A-8318; map ref. 191002–14/651456–73). 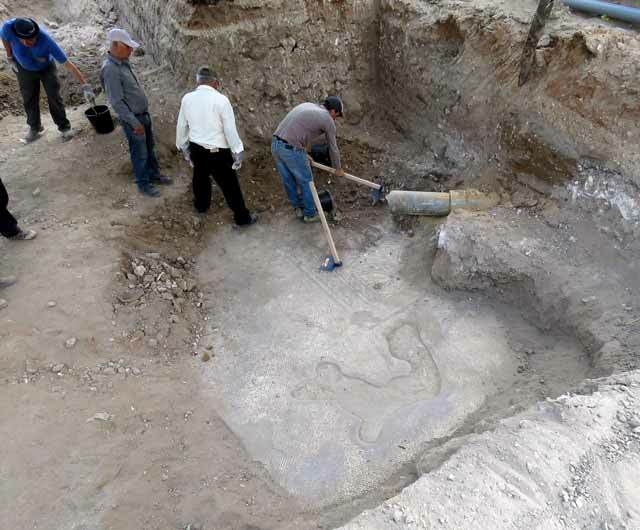 The excavation aimed to complete a project undertaken in 1996, 2009 and 2014 and examine an area slated for infrastructure work for the visitors’ center under construction at the site (Fig. 1). 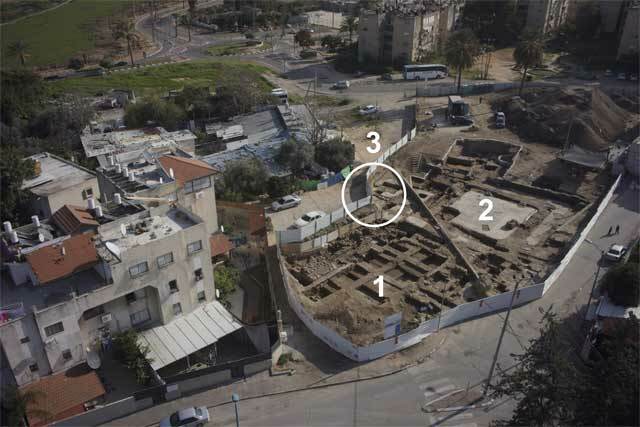 The excavation, undertaken on behalf of the Israel Antiquities Authority and financed by the Shelby White Foundation, was directed by A. Gorzalczany, with the assistance of D. Masarwa (site clearance), R. Mishayev (surveying), A. Peretz and N. Davidov (field photography), E. Oren (safety), Y. Amrani and E. Bachar (administration), R. Abu-Diab (transfer of mosaic pavement), N. Zak (drafting), I. Jonish (computing), as well as D. Ben-Ami, A. ‘Azab and I. Korenfeld (Israel Antiquities Authority Central District). Following the excavation, the mosaic pavement was removed for the installation of infrastructure at the site. Once it is treated in the Israel Antiquities Authority’s mosaic laboratory and the building is complete, the pavement will be displayed at the visitors’ center. The Lod mosaic, discovered during development work (Avni and Gorzalczany 2015), was the central part of a Roman villa dating from the third–fourth centuries CE, in what was apparently an affluent neighborhood of Roman Lod (Yannai and Erlich 2015; for more information about the city, see Oppenheimer 1988; Schwartz 1991). 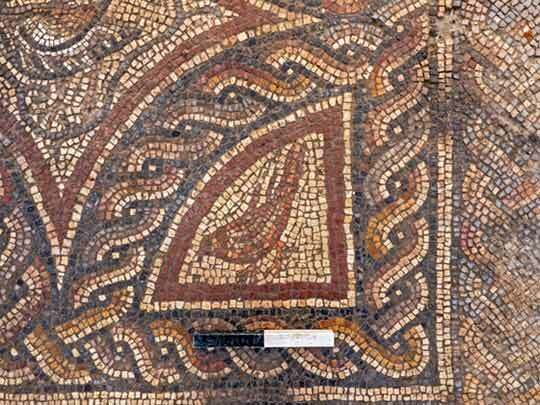 The mosaic was thoroughly excavated in 1996 (Avissar 1998; 1999; Figs. 1:1; 3:1), 2009 and 2014 (Gorzalczany 2016; Gorzalczany et al. 2016; and see additional references and discussion in both these references; Figs. 1:2; 3:2). 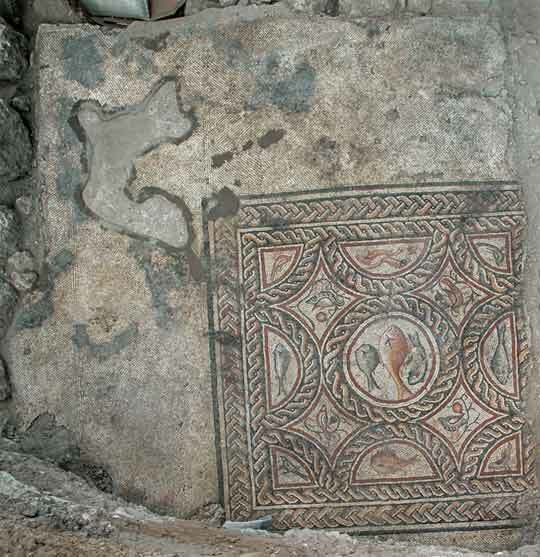 In 2014, several rooms were exposed in the east part of the villa, including a corner of another colorful mosaic of excellent quality (Fig. 1:3; 3:3). As it was only partially excavated at the time, due to excavation constraints, it was unearthed in the current season (approximately two squares; Fig. 2). Following extensive mechanical clearance of the site, the corner of the mosaic discovered in 2014 was once again exposed (L7503; Fig. 4), as were the stone walls delimiting it on the south and west (W8502, W8503 respectively). The walls were built of one or two rows of dressed stones of various sizes that were preserved to the height of one course (Figs. 1:3; 3–5). 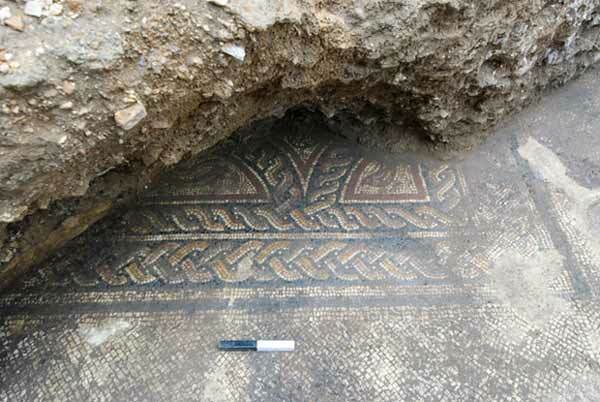 The 2014 excavation unearthed to the south of W8502 (width c. 1 m) another room (L7506) paved with a fine colorful mosaic, but it was covered over at the end of the excavation. Mosaic Floor 7503 abutted the walls; a niche in the west part of Wall 8502 (Fig. 4:2) was also paved with mosaic tesserae. The area to the east and north was excavated to in hope of determining the outer limits of the room. The exposed room is part of the east wing of the magnificent villa unearthed in the past, but its size could not be established. The room had a high-quality white mosaic pavement containing a colorful, quadrangular emblema—a central panel depicting figures or objects. The length of the emblema from north to south could not be established because the mosaic extended beyond the excavated area (Figs. 6, 7). Nevertheless, its style and symmetry indicate that the emblema was square. A segment of a modern sewage pipe crossing the excavation area from southeast to northwest was set almost at the level of the mosaic surface, but it did not damage it (Fig. 8). Nevertheless, it seems to have damaged an additional mosaic floor, lying at a higher level, to which belonged numerous tesserae that were found scattered in the fill of the trench dug in order to install the pipe. The stratum to which the scattered tesserae remains unclear. The emblema, composed of small tesserae and of excellent quality, is framed by several rows of black and white tesserae and twisted-rope and loop motifs in red of various shades, yellow, black and white. The emblema contains a round central medallion surrounded by several red, black and white concentric circles of increasing diameter, up to 1 m in the outer circumference (Fig. 9). Four half-medallions facing the four cardinal directions surround the central medallion, forming intersecting tangents (Fig. 10). Like the central medallion, these comprise several frames. The straight lines of the diameters of the half-medallions are arranged along the emblema’s outer perimeter. Four quarter-medallions are set in the emblema’s four corners, with their straight sides arranged along the corners (Fig. 11). Four rhomboid-like spaces with concave borders were formed between the central medallion, the half-medallions and the quarter-medallions (Fig. 12), providing further opportunities for artistic expression. The panel’s iconography is composed entirely of fauna, depicting only fish and birds. 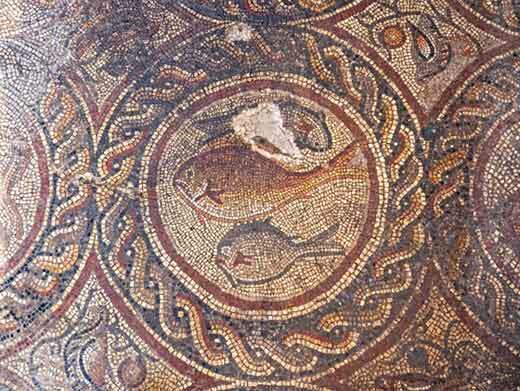 The central medallion—the part of the mosaic exhibiting the highest quality—contains three different species of fish swimming in opposite directions: two facing west and one facing east. The fish are rendered in gradating shades, demonstrating clever use of light and shade to create a sense of three-dimensional volume. The half-medallions also feature marine fauna: fish and probably dolphins. The quarter-medallions in the four corners of the emblema encompass a variety of birds. The rhomboids between the medallions and the semi-medallions feature birds perched on tree branches. These are familiar motifs, found in other mosaics unearthed at the site. 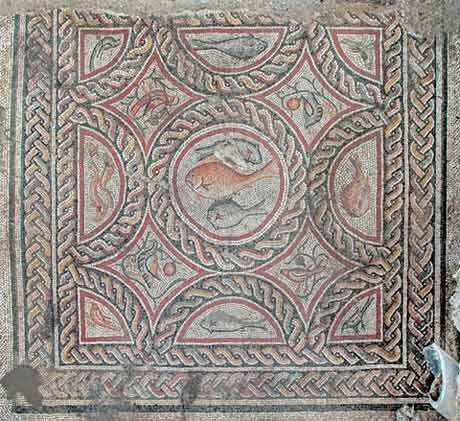 A trio of fish appears in the villa’s peristyle-courtyard mosaic, while birds are featured mainly in the mosaic sections of the triclinium (reception room) excavated in 1996 (Avissar 1998; 1999). The mosaic floor is made of tesserae of various sizes, depending on the artists’ needs. The average size of the tesserae in the central medallion (0.8 × 0.8 cm) allow for a detailed design. The stones in the semi-circles were slightly larger (1 × 1 cm), whereas in the frame and the corners, the tesserae were larger still (length 1.2 cm). Partially preserved strips of white mosaic (width c. 1 m) surround the emblema, extending up to the walls of the room. Missing parts were detected in the southern strip. The northern strip was demolished when a wide trench was dug for either antiquities’ robbery or the instalment of modern infrastructure. 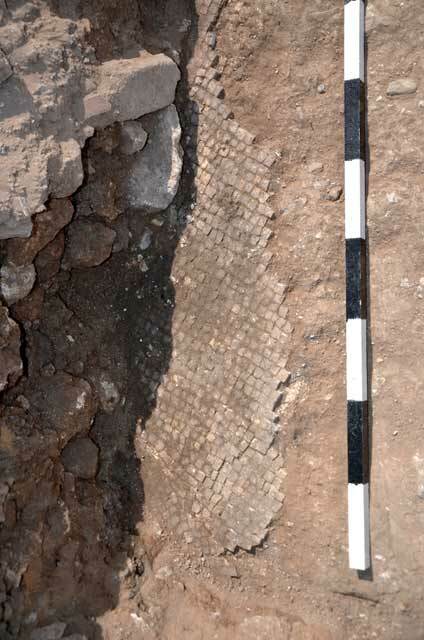 However, a white mosaic floor (L8506) seen in the northern balk of the excavation was identified as the white strip (Fig. 13)—probably the continuation of the strip that bordered the emblema on the north. The area east of the emblema was only partially excavated due to excavation constraints, but it can be assumed, for reasons of symmetry, that it also contained a white mosaic border. The same constraints curtailed the exploration of the room’s northern and eastern walls. The white mosaic strip bordering the emblema on the south contains a rectangular area (at least 1.0 × 2.6 m; the east side was not located; Figs. 4:1; 6), marked by a band of three rows of tesserae aligned differently than the ones around it. The rectangle may denote the place where a klinē, a couch or recliner for guests at a diner or a banquet. At such events, couches with cushions were set on three sides of the room, allowing one or more guests to rest or recline on each couch (hence the name for the room, triclinium, from the Greek word τρικλίνιον, i.e. ‘three klinē’). The fourth side of the room, which probably faced the entrance to the room, was usually left free to enable servants to come and serve food and drink to the guests. This description seems to fit the room unearthed in the excavation. The entrance to the room was probably set in the western wall, as there is no trace of klinē in the white mosaic strip on this side. The northern strip of white mosaic is destroyed, preventing the discovery of any mark corresponding to the southern one on that side. The eastern side of the room has not yet been exposed due to technical limitations (Fig. 14); should a similar mark be found there in future excavations, it would confirm our hypothesis. If this identification is correct, the room represents an additional triclinium—a reception room supplementing the magnificent triclinium exposed in 1996. It should thus be assumed that the villa’s residential rooms (cubiculae) either extended eastward or occupied the second floor, and that in either case the size of this luxurious villa was much larger than previously thought. A villa of this type could certainly have included several triclinia, as is the case in similar magnificent buildings found throughout the empire. Several clusters of dark spots found on the mosaic floor are probably burn marks. It is possible that the villa was destroyed or damaged by an earthquake or some other violent incident, when toppled lamps led to a fire. 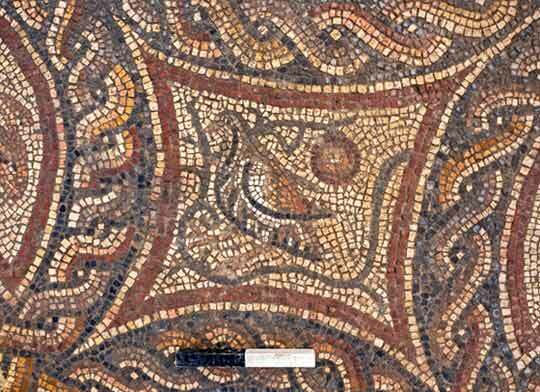 The design of the floor and the iconography depicted in the mosaic are familiar in the region. An almost identical parallel was uncovered in the excavation on the southwest slope of Mount Zion in Jerusalem, c. 120 m south of the Church of Saint Peter in Gallicantu (Avner 1994:21*). The two mosaics are strikingly similar in composition and iconography. 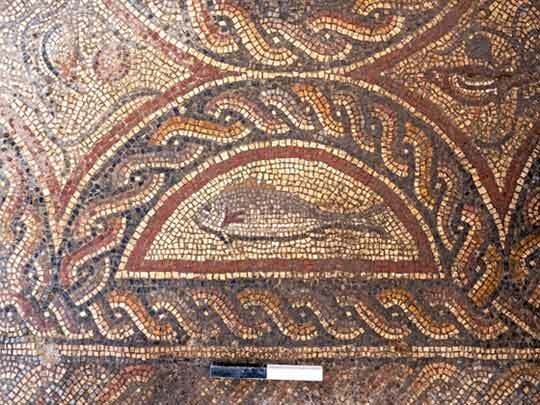 The main difference between the two is that instead of the trio of fish in the central medallion, the Mount Zion mosaic contains a full-face depiction of a person identified by the Greek letters ΓΗ (Ge)—Gaia, the Greek goddess of the earth and the ancestral mother of all life. Apart from this difference, the choice of motifs and fauna is identical. This choice does not seem random, as the absence of human figures is striking in all the mosaics recovered to date in the Lod villa. This preference may have had an ethnic, cultural or ideological origin. In terms of style and composition, parallels dating from the second–fourth centuries CE are common in various parts of the Western Empire, including Britain, Germany, Yugoslavia, Italy, France and Spain (Avner 1994:23*, and see the comprehensive discussion and numerous parallels cited there). These artistic choices confirm the conclusion that the villa’s occupants had refined, cosmopolitan tastes. Their choice of artistic decorative styles incorporates aesthetic influences originating in North Africa (Africa Proconsularis), as in the main triclinium (Talgam 2014:69–70), while also demonstrating western influences (Avner 1994:21*), as in the mosaic discussed here. Despite its limited scope, the current excavation makes an important contribution to our understanding of the magnificent residential compound exposed in Lod. 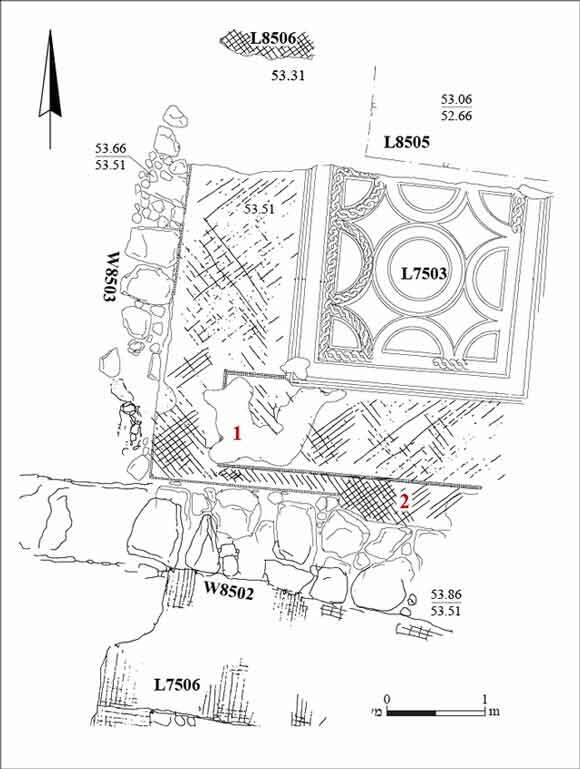 It further clarifies the plan of the villa, whose form and function were not sufficiently evident prior to the current excavation due to various constraints imposed on work at the site. We are now able for the first time to examine parts of the villa other than the triclinium (1996 excavation) and the peristyle courtyard (2009–2014 excavations), for which several hypotheses were proposed in the past. It appears that the excavation uncovered a triclinium, rather than a private residential room (cubicula), and thus the question of the location of the residential quarters remains unanswered—did they lie to the east or on a second floor?—as do such questions regarding the service wing, the storerooms and the overall extent of the villa. Based on the quality of the mosaics, this part of the building was also luxurious, reflecting the refined living standards and opulence enjoyed by its extremely wealthy owners. The final size of the building is not yet apparent, but the obvious fact that it is a rich compound confirms the conclusion that this part of the city was an affluent neighborhood, where the cultural, social and economic elite of the Roman city of Lod lived at the height of its prosperity. Avissar M. 1998. Lod—A Mosaic Floor. ESI 17:169–172. Avissar M. 1999. Lod—Mosaic Pavement. Qadmoniot 117:41–43 (Hebrew). Avner R. 1994. A Roman Mosaic on Mount Zion, Jerusalem. ‘Atiqot 25:21*–25* (Hebrew; English summary, 188–189). Gorzalczany A. 2016. 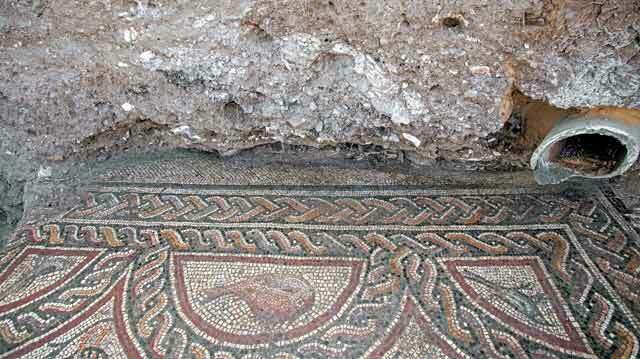 The Manor from the Late Roman Period at Lod: The Magnificent Mosaics Discovered during the 1996–2014 Israel Antiquities Authority Excavations. In A. Shavit, T. Da‘adli T. and Y. Gadot eds. 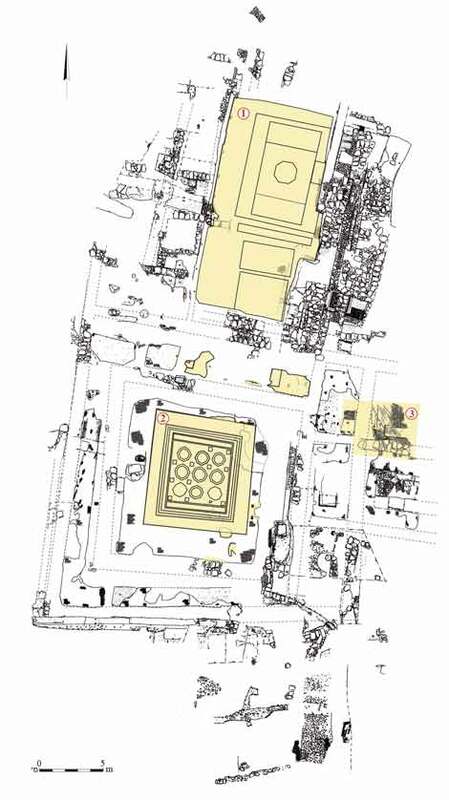 Lod, “Diospolis—City of God”: Collected Papers on the History and Archaeology of Lod 2. Lod. Pp. 83–104 (Hebrew). Gorzalczany A., Avissar M., Torgë H., ‘Ad U., Jakoel E. and Elisha Y. 2016. Lod, the Lod Mosaic. HA-ESI 128. Talgam R. 2014. Mosaics of Faith: Floors of Pagans, Jews, Samaritans, Christian and Muslims in the Holy Land. Jerusalem. Yannai E. and Erlich A. 2015. Graves and a Building with Mosaics from the Roman Period in Lod-Diospolis. Eretz-Israel 31:210–220 (Hebrew; English summary 189*). 1. The mosaics discovered in the Lod villa: the triclinium excavated in 1996 (1), the peristyle courtyard excavated in 2014 (2) and the current excavation (3). 2. Corner of mosaic partially excavated in 2014, looking east. 3. Aerial photograph of villa and mosaics, looking southeast: the triclinium (1), which has been removed; the peristyle-courtyard mosaic in situ (2); and the current excavation area (3). 5. Uncovering the mosaic, looking northeast. 6. General view of mosaic room, with traces of a fire, looking west. 7. The mosaic after cleaning, looking north. 8. Modern pipe installed above the mosaic, looking north. 9. The central medallion with three fish swimming in opposite directions, looking north. 10. A half-medallion near the southern end of the emblema, looking north. 11. A quarter-medallion in the southwest corner of the emblema, looking east. 12. The southwestern rhomboid of the emblema, looking northeast. 13. A patch of mosaic (L8506) in the northern balk of the excavation, looking north. 14. Eastern border of the emblema, with a pipe above mosaic to the right. Later remains, including many mosaic tesserae, are seen scattered in the fill. Looking east.